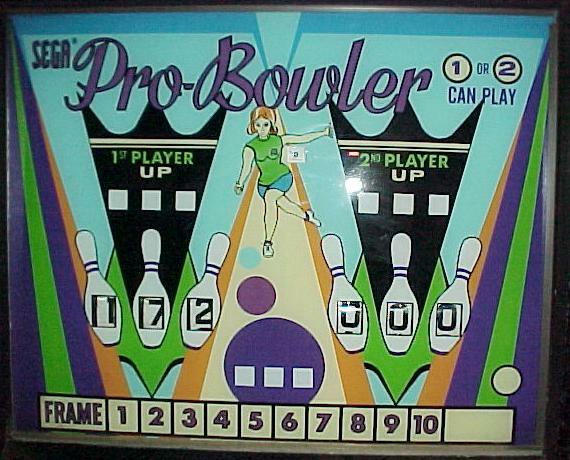 Description: Pro-Bowler, Sega, 1972, two players, mechanically animated manikin bowling game. Basically a copy of Williams' Mini Bowl (8/70). Five foot playfield length. Scores just like regulation bowling. Relays in this Sega game are the enclosed and socketed variety. 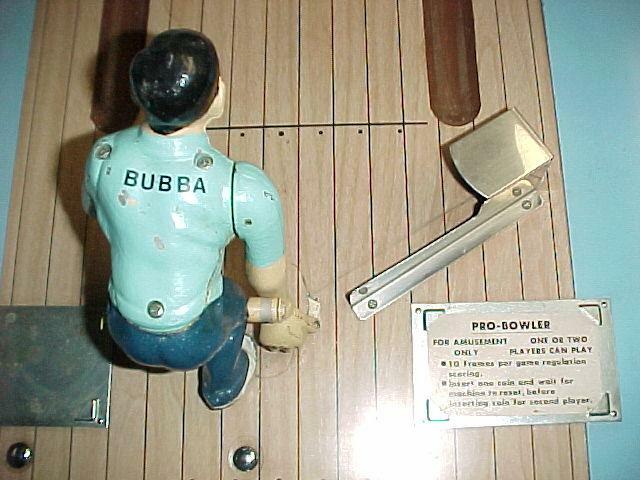 As with Mini Bowl, Pro Bowler is not as desirable as Williams' 1957 Ten Strike/Ten Pins manikin bowlers. 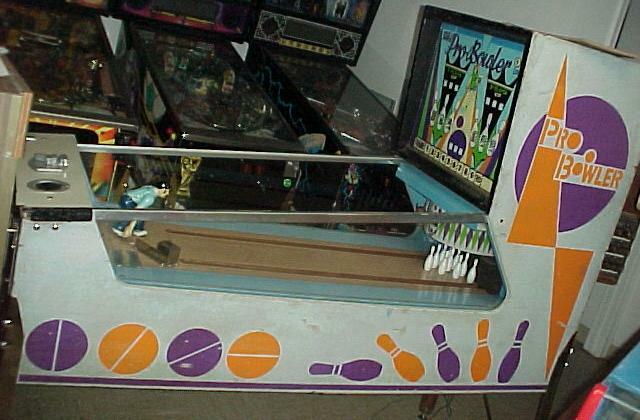 This is due to several factors: bulky cabinet (the head does not detach from the body), limited visibility of the manikin (due to the cabinet style), the 1970s era "pointy" artwork, lack of the 1950s "woodrail" cabinet construction, ball delivery from the pins to the manikin *under* the playfield instead of on top, and that Sega is not a U.S. company. Click here for a 15 second MPG movie (1.3meg) of a Pro Bowler being played in one player mode. 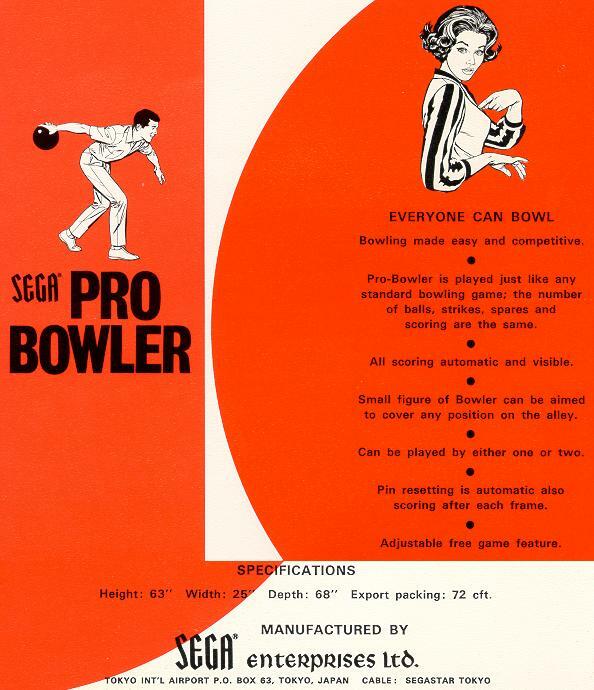 Note the drawing date on the schematics for ProBowler is 1972. But reportedly, this game was made as late as 1976. Top glass size is 22" x 44.5” x 3/16” tempered glass. 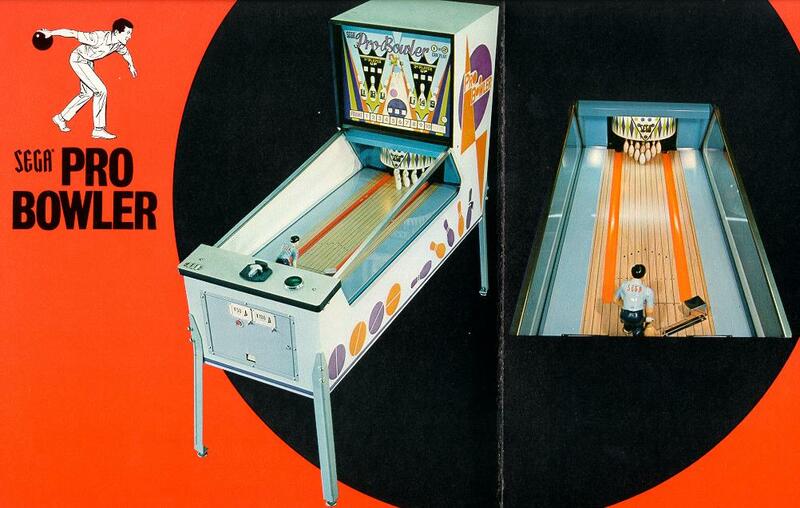 Uses one pinball 1 1/4" diameter. Game has a few technical problem (aside form the usual manikin game troubles). One is the transformer is not as robust as American made games. This is the problem for the G.I. (General Illumination, 6.3 volts). 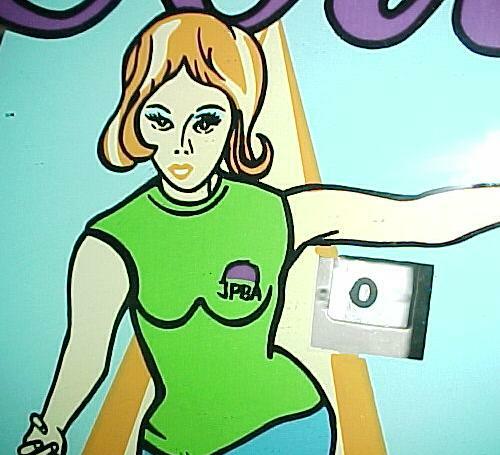 If all the bulbs are installed for the game, only about 4.3 volts is available. 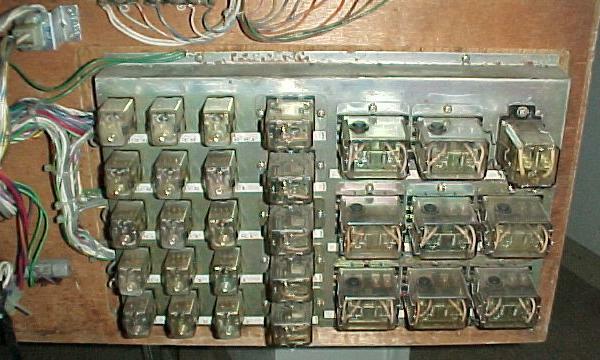 As bulbs are removed, the voltage goes up (indicating the transformer can't supply the necessary current to light all the bulbs!) Another problem are the relays themselves. The plug/socket arrangement be trouble, as the male plugs on the relays turn brown and don't conduct. These can be cleaned though.